We started hiking at 6:30am this morning knowing we had a big day ahead of us. 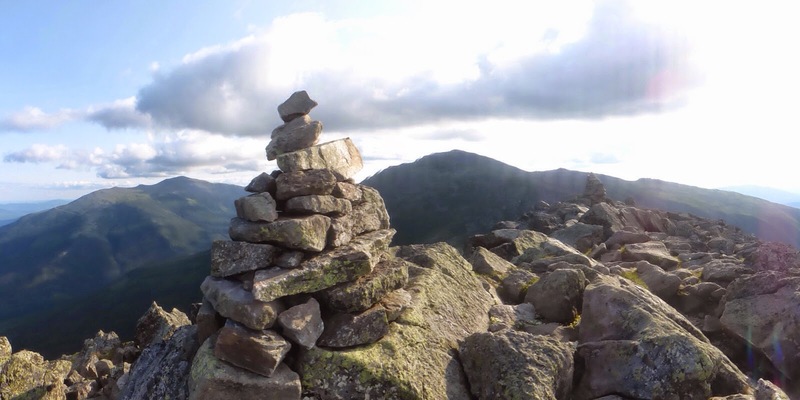 We planned to do just under 20mi over the Presidential Range. We knew it was a lot of miles for this section, but we were up for the challenge and there was a hut we could stop at sooner if the miles took longer than we hoped. 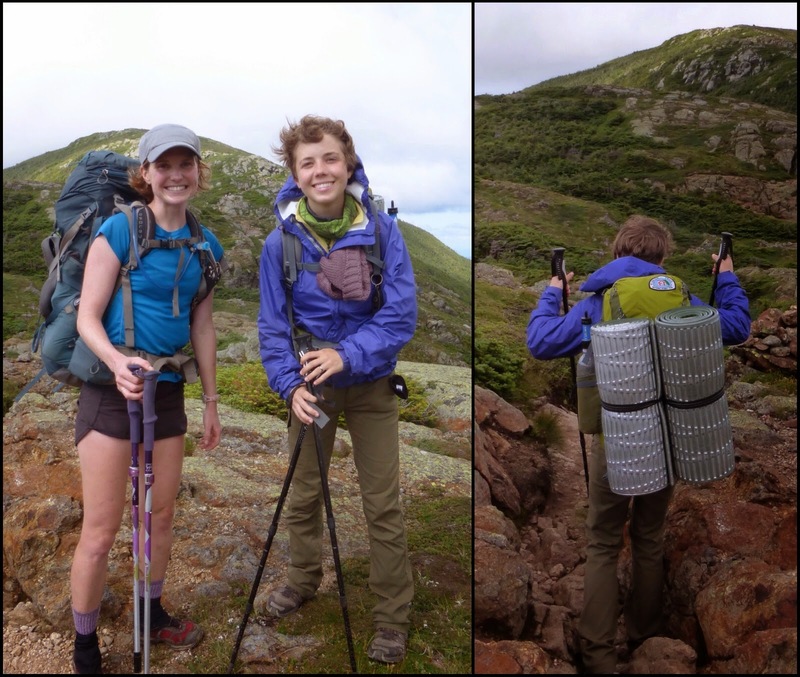 We had camped at the south end of the Webster Cliffs and had some climbing to do this morning along the cliffs and then over Mt Webster and Mt Jackson. It was very slow going with much of it being a rock scramble, but Jett Cat and I were having fun with it. I’m starting to think that the combination of the two of us together could have fun doing anything with how amused and entertained we are by each other. Here is Jett Cat along the Webster Cliffs and examples of the straight up scrambles this morning. Around 9am, we came upon Mitzpah Hut. We have gotten spoiled by the huts because they tend to be right on trail and they have bathrooms, snacks to purchase, indoor seating to eat or relax, and tap water to refill our water bottles. We had also heard that if they have leftover food from meals, they will give it to hikers. Since it was just after breakfast, we asked about leftovers. 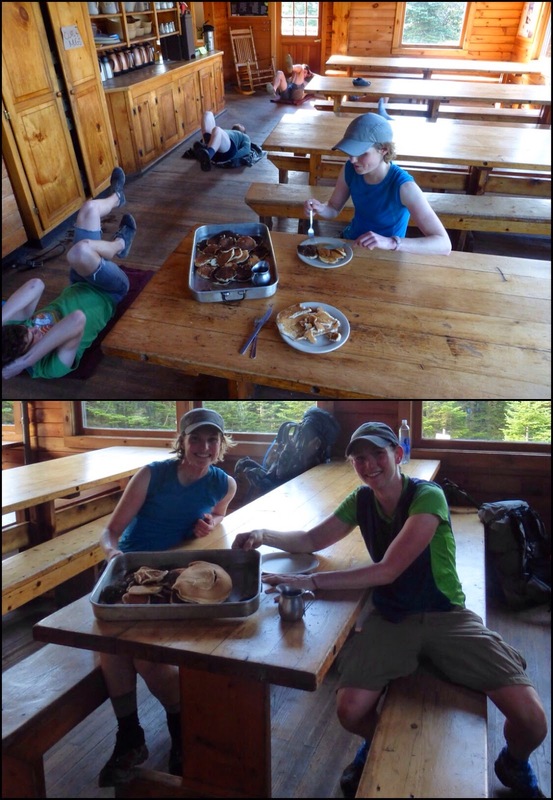 As soon as they realized we were thru hikers, they brought out all the extra pancakes and syrup from the morning. It was great! The funny part was that the young staff was just about to do their morning workout routine that they all do together after all the overnight guests leave. They turned on music and laid all around us and had a whole routine that they went through. I just had to get a picture of the scene as we stuffed ourselves with as many pancakes as we could. Some of them you can’t even see behind the tables. 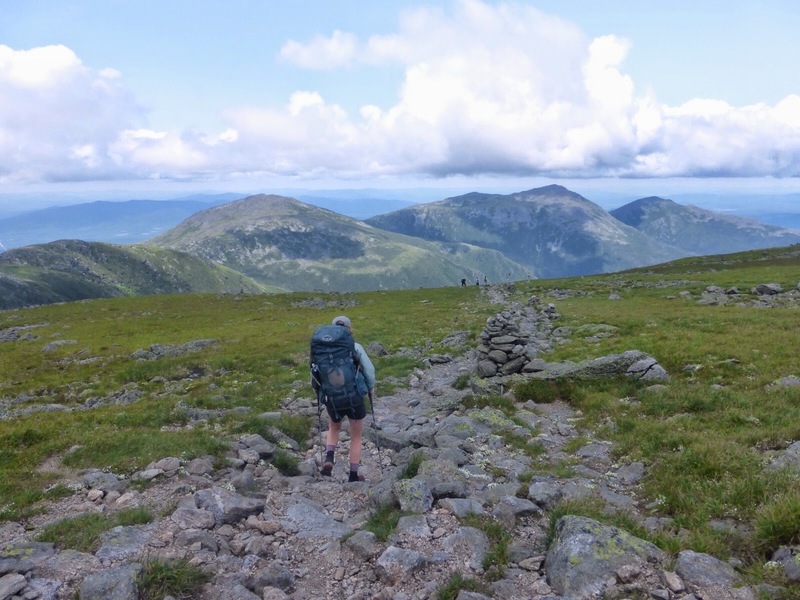 After our second breakfast, we set out to enter the Presidential Range, which would be a full day on exposed ridges along and over the Presidential peaks. We saw many southbounders this morning and they seem like a great group this year. Jett Cat even got to meet the SOBO named Jet Pack, which was Jett Cat’s original trail name, ha! 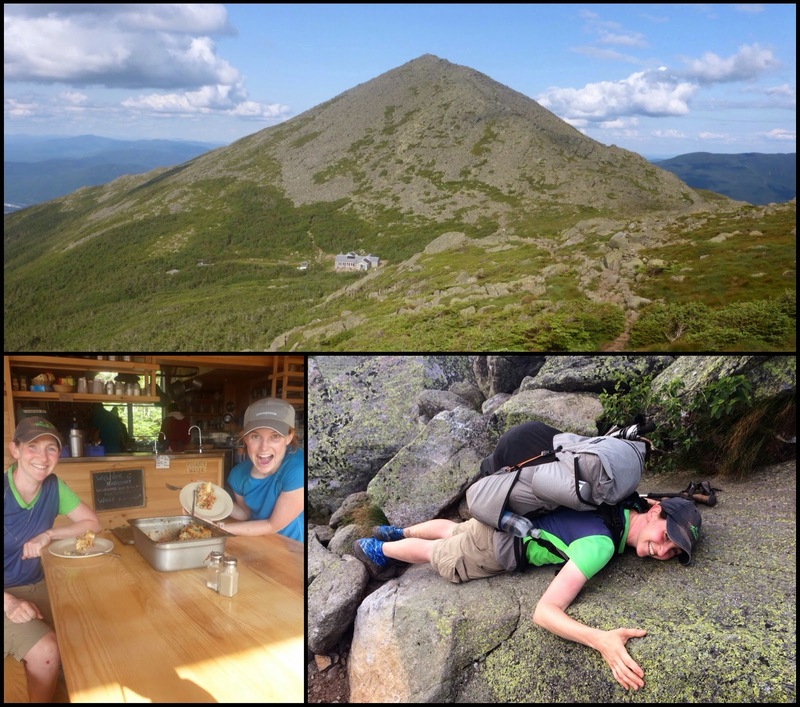 By lunch we hoped to make it to Mt Washington, which is New Hamphire’s highest peak at 6,288ft. It is also where the highest ever wind speed was recorded at something over 200mi/hr. It can also be rare to get a clear day up there with how high it is and we were worried when we first the top covered by low lying clouds in the distance. As we hiked closer over the next couple of hours, the clouds thinned and our timing was perfect! We were so happy and took tons of pictures up top. It was windy and much colder at the summit once we stopped hiking, so we were even more excited to head into the building that sold food at the summit. 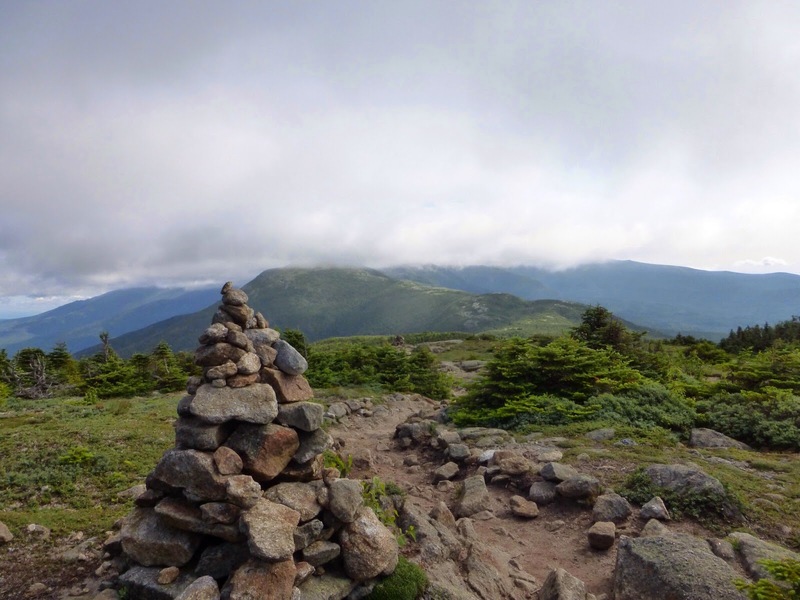 Mt Washington is quite the tourist attraction. It is easy to drive up and park at the top, but many ride a touristy train up from the valley. There were a TON of tourists and it was packed up there. We got lunch inside and even though we both had food in our packs, we couldn’t resist getting hot chocolate and warm food for lunch. I indulged in pizza and chili. 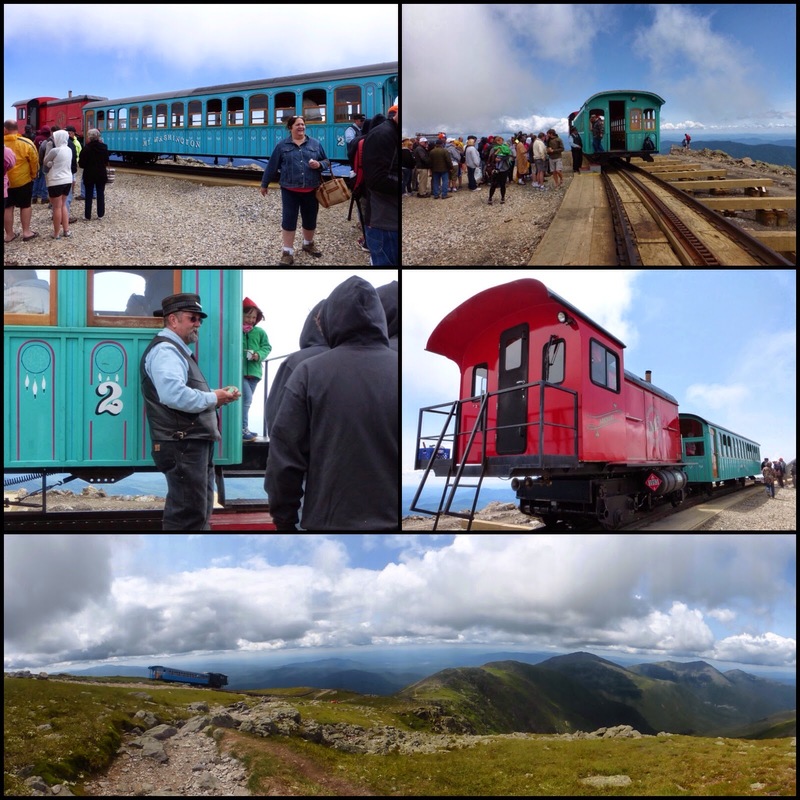 As we hiked down Mt Washington, a train came down. The tradition is apparently for thru hikers to moon the trains, but neither of us could ever work up the nerve to moon anything. It was really slow going the rest of the day with very rocky trail. We even took a wrong turn at a sign that was not clear and seemed to point a different direction for the AT. It was 10mins on scree before we noticed and turned around. It was only 20mins, but we knew we were already pushing it with time. 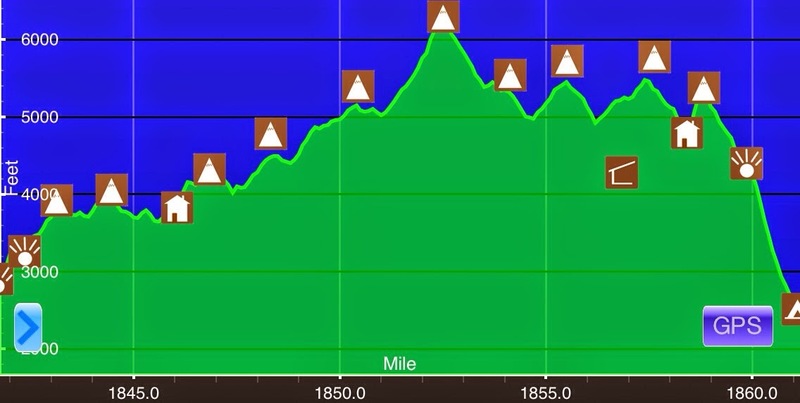 It was pretty much a whole afternoon on scree and rocks at a 1.5mi/hr pace much of the time and sometimes even slower. Yesterday Jett Cat had her slips and today was my turn. My ankles have a history of problems and they certainly rolled and wobbled plenty today. At one point I scratched my knee a bit with a slight fall, and on another I reopened a knee scar from an earlier fall this hike when I scraped my hiking pole across my knee. At the end of the day, we reached Madison Spring Hut just after 5pm. We went inside to fill our waters and the staff offered us leftover lasagna after hearing we were thrus. The lasagna was cold from the being in the fridge, but that didn’t stop us from eating plenty. It was just what we needed to power us for last three miles. 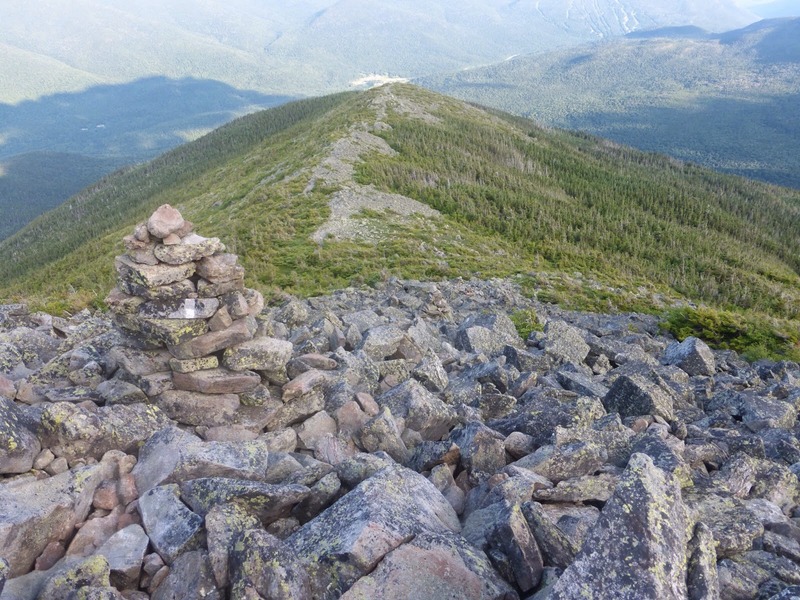 In the picture below, you can see the steep climb we did up Mt Madison which we saw from a distance surely thought wasn’t a peak the AT goes over. We were shocked when we went straight over the top of that sucker. 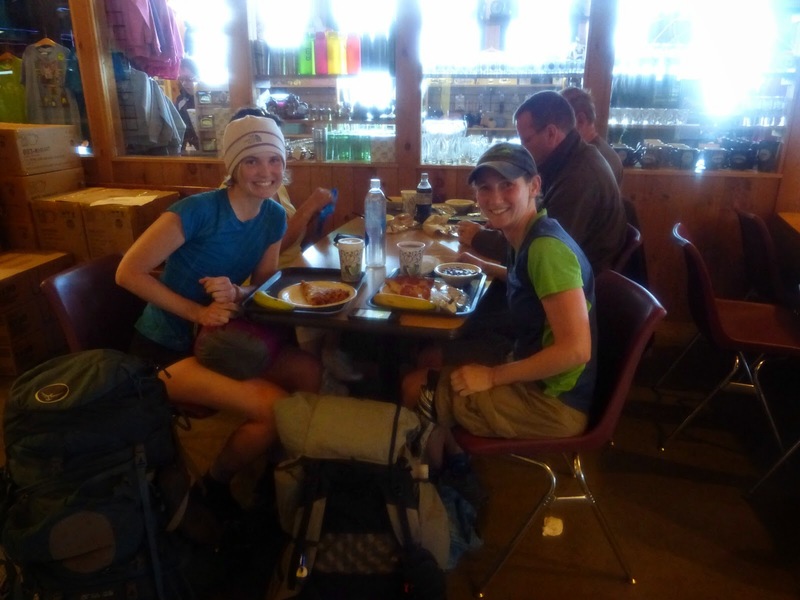 When we first left the Madison Hut, it was quite cold and windy. 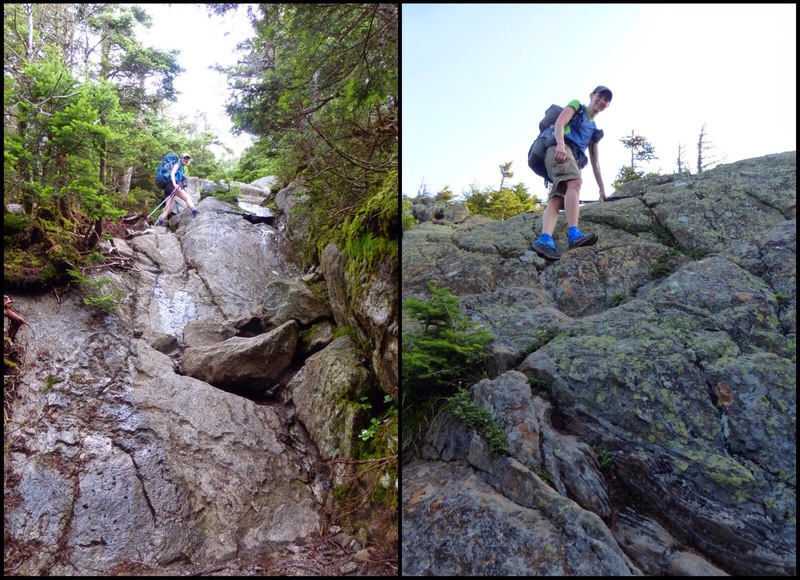 The climb was a straight up scramble most of the way. I noticed the rocks were warm from the sun and as you can see, I was very happy just do lie there on the warm rock and take a break rather than scramble up it. That peak behind the hut below is what we went over. 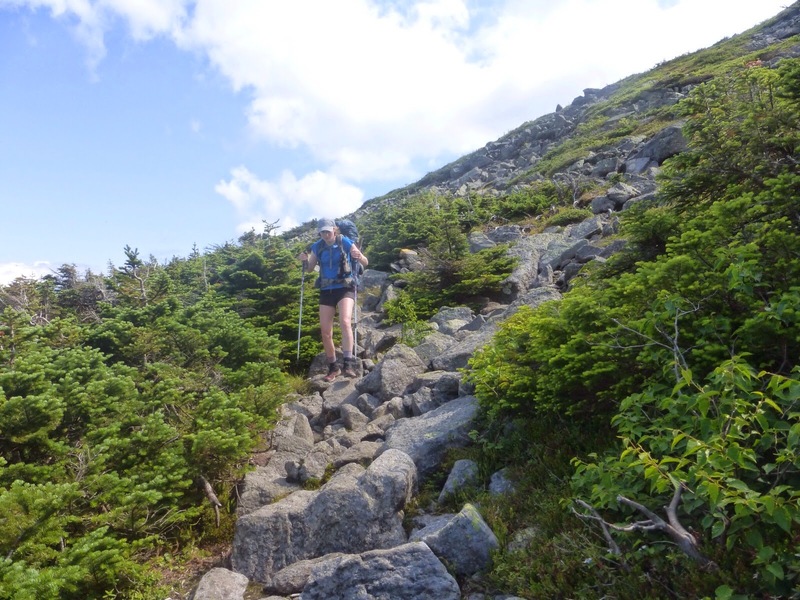 Once we make it to the top of Madison, it was a STEEP Rocky downhill for about two more miles. We were told by non thrus that it would take 1.5-2hrs to go the 2.7mi from the hut to our campsite and we were skeptical…they were right! 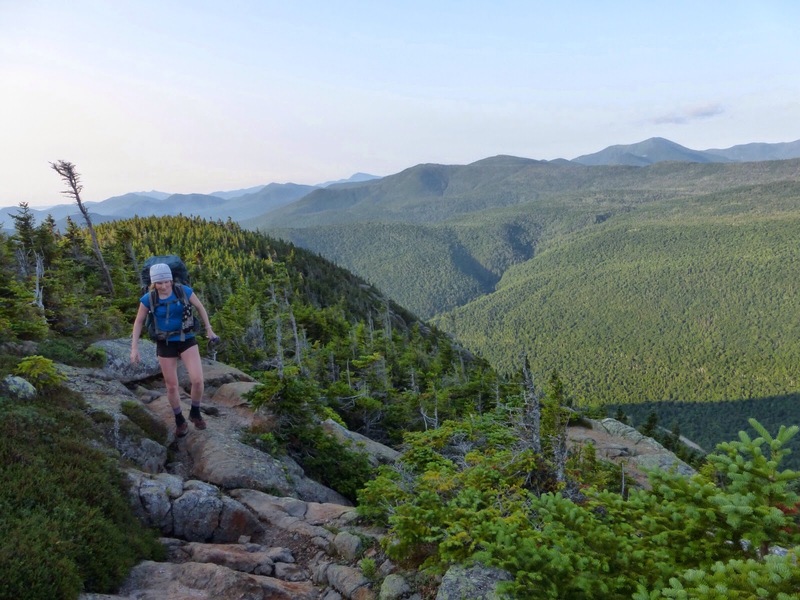 We agreed that I’d go on ahead as my knees react better to downhill and I needed to get to camp to blog. Man, it was rocky and straight down! It ended up taking me two hours to go 2.7mi and my knees were shaking. I got to the Osgood campsite at 7:30pm and Jett Cat arrived at 8pm, whew, what a day! We set up on the platform and I was able to use the screw in hooks that I brought for just this reason and they worked perfectly! 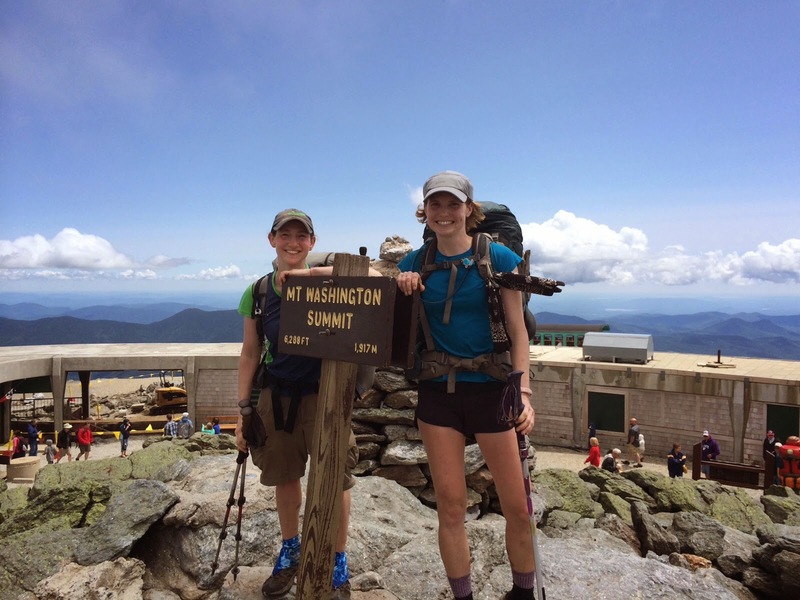 We really enjoyed today and realize we could have stopped early at the hut, but it just isn’t in our nature and we wanted that extra challenge of going over Mt Madison. There weren’t any thrus at the hut when we had arrived, so we could have stayed there for free if we did work for stay. 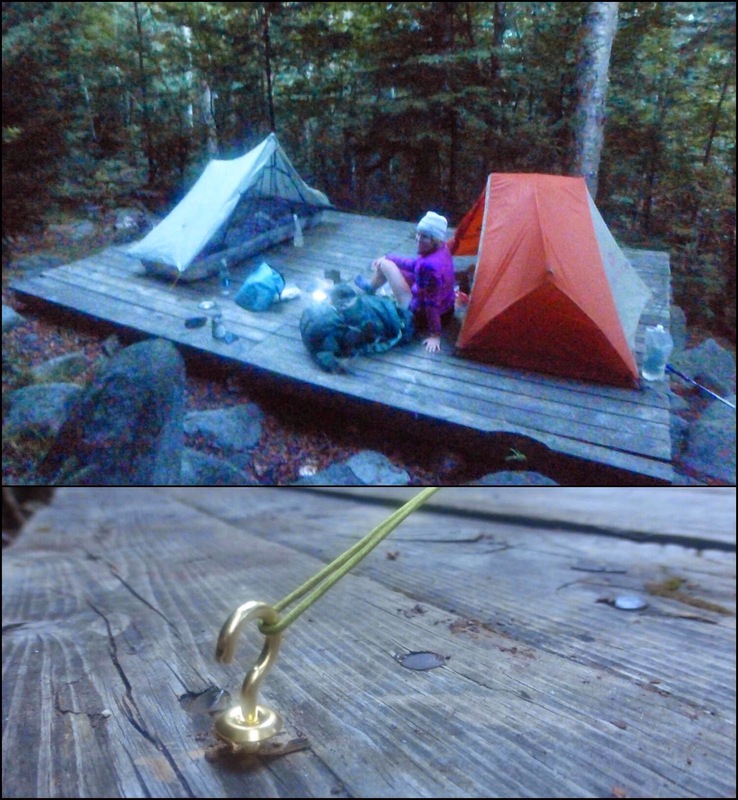 Both of us prefer our tents and less people, so we hiked on. There are few thrus who would have made that choice at the end of a long day and I’m just so happy to have Jett Cat along who truly enjoys hiking and challenging herself. She too had wobbly and achy knees and even though we are both resistant to using medicine, we both took ibuprofen to help our knees recover from that crazy decent. What a great day. Today totally satisfied our hunger for food and great hiking! Finally some views! This section has been a good one.